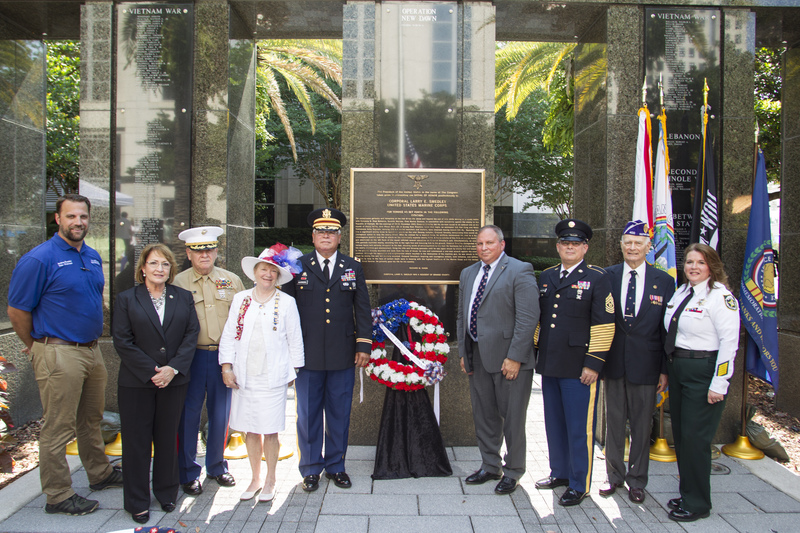 The Orange County Mayor’s Veterans Advisory Council recently hosted the War Memorial Commemoration Ceremony at the Orange County Courthouse to honor the nation’s fallen Sailors, Soldiers, Airmen, Marines and Coast Guardsmen. The ceremony recognized the 50th anniversary of the Vietnam War and paid tribute to the fallen and those held as prisoners of war or listed as missing in action in Vietnam. The ceremony’s keynote speaker was retired Army Lt. Gen. Jack Stultz, who served as Commanding General of the U.S. Army Reserve. During his 38 years of service, Lt. Gen. Stultz was awarded the Defense Superior Service Medal, Legion of Merit, Bronze Star, Meritorious Service Medal Army Commendation Medal and the Army Achievement Medal. Lt. Gen. Stultz reflected on the Memorial Wall that features the names of the 162 service men and women who lost their lives or were missing in action in Vietnam. No new names were added to the memorial this year. Lt. Gen. Stultz joined Mayor Jacobs and Jr. ROTC Cadet of West Orange High School (WOHS), Lt. Caleb Smith, in the laying of a commemorative wreath, which was followed by the playing of “Taps,” performed by WOHS student Josh Metz. Metz, a member of the WOHS marching and symphony bands, played “Taps” for the first time in January 2016 at his mother’s funeral. His mother, Marie Metz, enlisted in the U.S. Air Force and served tours in Germany before returning to San Antonio, Texas and relocating to Florida in 1987. Mayor Jacobs presented Metz with a military flag challenge coin on his mother’s behalf for her dedication and service to the nation. Mayor Jacobs also read a resolution calling on citizens to observe Memorial Day and pay special tribute to those who gave their lives so that we may live free. Retired U.S. Army Colonel Edwin R. Marrero, Orange County Mayor’s Veterans Advisory Council Chair, hosted the ceremony. Members of the Orange County Mayor’s and City of Orlando’s Veterans Advisory Councils led the Pledge of Allegiance; Elouise Hall, member of the Orange County Mayor’s Veterans Advisory Council and a member of the Daughters of the American Revolution, offered the Invocation; Vice Chair of the City of Orlando Mayor’s Veterans Advisory Council, Andrew Ewasko, introduced Lt. Gen. Stultz and retired Navy Chaplain Capt. Richard Black delivered the Benediction. On May 25, 2012, President Barack Obama proclaimed May 28, 2012, through Nov. 11, 2025, as the Commemoration of the 50th Anniversary of the Vietnam War, calling upon federal, state and local officials to honor our Vietnam veterans and fallen heroes. A collection of photos from the Orange County War Memorial Commemoration Ceremony is available on Mayor Jacobs’ Flickr album.